Kristin and I had both been working alot lately and she had some vacation time she had to use (use it or lose it). We wanted to get out into nature, do some paddling, and eat healthy food to rejuvenate ourselves. But we couldn't afford to go too far. 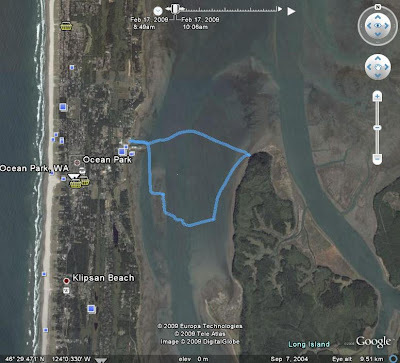 So we decided to head to the Long Beach Peninsula for a few days. We headed out on Sunday Feb 15 after Valentine's Day, pointing the car in the direction of Astoria. We stopped for a nice paddle from Knappa on the way. That was about 5.4 miles. Definitely enough so we were ready for dinner! In Astoria we stayed at Clemintine's B&B, which was lovely. We showered and headed to Baked Alaska for dinner -- the first of our seafood dinners of the trip. So far, the trip was going according to plan: nature, exercise, healthy food. I love it when a plan comes together. So on this sunny February day Kristin and I wandered the town and toured the Flavel Museum -- very worthwhile. And hit up the Blue Scorcher Bakery for bread for the trip. We then got in the car and headed north. Stopped in Ilwaco for lunch -- more seafood! Then bought fresh seafood from a local market to cook at our cabin for the next couple days. We stayed at Shakti Cove Cabins, which are very peaceful. Just the kind of relaxing setting we needed. Kristin made a great dinner of prawns and sole. 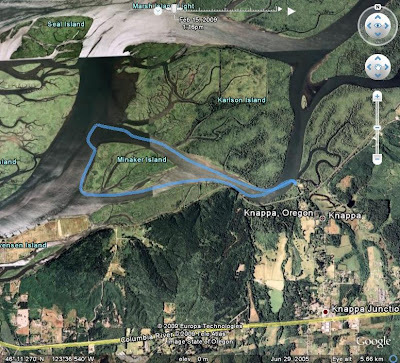 We wanted to paddle Willapa Bay. We'd never done that. But on the days of our trip the tides were not in our favor. High tides at about 7 am. Low tides were about 1 - 2 pm. And Willapa Bay has lots of mudflats at low tide. Very easy for boats to get stranded in the mud til the tide comes back up. But if you stay in the narrow channels that are deeper, the current can be very strong, sweeping you out toward the bar, and you really don't want to go there. So we got out on the water early on Tuesday morning to avoid low tide. Put in at Nahcotta. And paddled east to Long Island. Take a look at the GPS track of that trip and you'll see that the ebb did push us a bit north at first til we figured out how strong it was. There was still plenty of water when we got to the island. Nice river rock beach. Yeah! We walked around on the island for awhile. Lots of elk tracks. But didn't want to stay long since the tide was ebbing. By the time we left the boats were high and dry. We had to carry them across a good bit of mud to get back to the water. 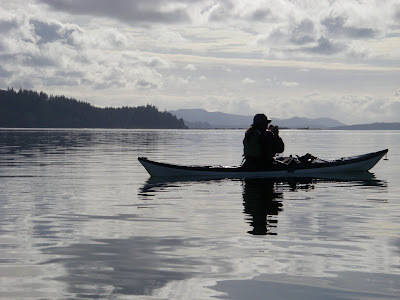 Our plan was to paddle south against the ebb in the shallow water near Long Island to avoid the strong ebb current in the channel, then head west across the channel and let the ebb take us back to Nahcotta. And our plan worked. We had an amazingly calm February day. We took advantage of the beautiful weather to practice technique in the clear shallow water near Nahcotta. Yep, saw lots of oysters.